The Paleo Diet by Loren Cordain was a disappointing read for me. I am always quite interested in new approaches to diet and exercise and that is why I got so interested in this book. However, the end result is that I didn't really learn much more than I could have from the web for free. The author spends far too much time trying to convince us that cavemen at a certain way. He even wants us to beleive that their way of eating can be called “health secrets.” I was willing to believe that cavemen ate a certain way from the outset. That's why I bought the book — I was interested in how to eat like a caveman. He lost me when he started talking about low carb diets. The author wants you to buy into the fact that the Paleo Diet is not just another low carb diet. Let's see, they want me to eat nothing but lean meat, fruit and vegetables. That sounds low carb to me. In fact, it is a different type of low carb, but it is definitely another low carb diet. 30 pages to describe stuff we all already know is just ridiculous. You are telling me to eat a certain way, so get to it and list some food I can eat and some food I cannot eat. That gets the point across much faster. The book really took a turn for the worse when I saw the title to Part Two–Losing Weight and Preventing and Healing Diseases. Sorry, but there are alot of reasons why eating just lean meat, fruit and vegetables will make you healthier. It isn't magic, so why present it that way? Now, before I get a ton of comments saying “The Paleo Diet works” I want you to remember that alot of diets work. I have tried so many different thnigs that I am convinced my metabolism is messed up. I am working with a way to fix that (more on that at some point in the next 30 days), but the fact is that these diets all work for a short period of time. I don't see the Paleo Diet as a sustainable way of life. It is far too impractical for most people. 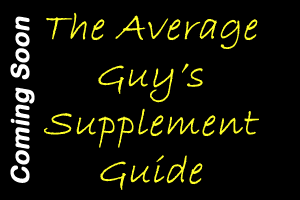 It will require (in my opinion) far too much supplementation to make it work. The bottom-line: I didn't like any of this book and wish I had never purchased it. The Stronglifts 5×5 workout is a hybrid of the Starting Strength workout by Mark Rippetoe. The aim is to build strength and muscle. The question: is it effective? This program involves 2 workouts lifting 3 times a week, rotating both workouts in an alternating fashion. If you were to lift Monday, Wednesday and Friday you'd do Workout A on Monday, Workout B on Wednesday and Workout A again on Friday. You'd start again the next Monday with Workout A. These are very difficult workouts to say the least. You are squatting 3 days a week. 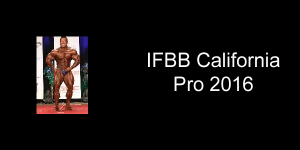 This program takes full advantage of the progressive overload principle. You use a weight that can get you every repetition. Each time you do a workout you increase the previous weight by 5 pounds. Again, does this work? You will be amazed at how well you do on this program. I increased my 1 RM on squats from 325 pounds to 435 pounds in 12 weeks. During that same period my 1 RM for deadlifts went from 375 pounds to 495 pounds. The strength gains were enormous. It was a very easy program to stick to. I was worried I'd get bored, but the constant increase in the load really kept me motivated. I would highly recommend this program to anyone wishing to gain strength. I did not see much of an increase in size (except my legs, which grew by 0.75 inches over the 12 weeks). Give this program a try. It is now in my arsenal for future training cycles. Better Than Steroids by Dr. Warren Wiley was a very interesting read on many levels. The book is all about how to eat if you want a bodybuilder's physique. That's the meat of the book–how to use food in the way some people use steroids. Dr. Willey recommends a Ketogenic Diet for fat loss and lean mass building. This involves high fat, moderate protein and very low carb eating. The idea is to keep carbs under 30 grams a day in order for the body to enter a state of ketosis. The idea is that the body starts to utilize fat more for energy when in this state. 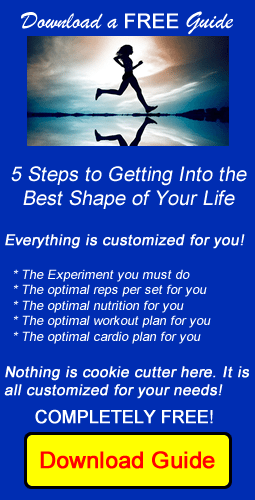 This means that you will soon lose more fat when using this approach to eating. At the same time, the higher fat content will increase testosterone production, which will help you with building lean muscle mass. The training principles presented in the book are nothing new. Dr. Willey advocates the standard high volume weight training approach that is advocated by most body building types. It really offered nothing new to me, but if you are not well-versed in the various ways to train I am sure you will get something out of this section. Dr. Willey advocates the HIIT method of training for cardio. This is one of the most successful methods of cardio training out there right now. It can result in some amazingly quick fat loss in a short period of time. Dr. Willey makes the point that combining HIIT with the keto approach to nutrition you are going to really blast your body into fat loss mania. I personally don't think much of the keto approach because I find that it takes away strength I need for intense training sessions. However, I cannot argue with the success many have achieved using the keto approach. However, the HIIT recommendation is something I agree with 100%. Dr. Willey spends an entire chapter on the importance of water. He explains why water is so important. He then gives some recommendations for the amount of water you should take in (0.75 x your weight in pounds). Again, the premise is that it is better to give your body the right food and the right amount of water than it is to take steroids. I would recommend this book to anyone who wants a fresh look at how to get into shape. The information presented on nutrition is excellent. Yes, he spends alot of time on keto, but also talks about zig zagging and other methods of eating. You will learn alot from this book. I give it a thumbs up. If you have read this book, give us a comment. When reviewing The New High Intensity Training by Ellington Darden, I took into consideration alot of factors. My focus in today's review will be effective background material, effective support of the subject matter and effective training programs. Dr. Ellington Darden, the author of this book, is one of many people who support the findings of Arthur Jones which ultimately became termed High Intensity Training. Dr. Darden has studied the principles of High Intensity Training and presents them very clearly in this book. His explanations make sense and are easy to understand. The reader will come away with a strong understanding of High Intensity Training. Dr. Darden explains how Arthur Jones discovered the principles behind High Intensity Training. 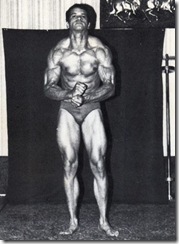 He examines the efforts of several young bodybuilders as they implemented the principles given by Jones. These real world examples help the reader understand the validity behind the principles Arthur Jones laid out. To show us that High Intensity Training works, Dr. Darden begins with a story about Arnold Schwarzenegger. Apparently, Arnold was not too impressed with High Intensity Training until he gave it a shot and was humbled by it. 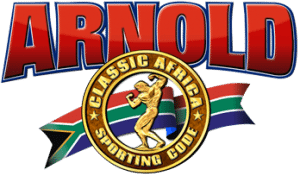 This is a great story because Arnold is such a well-known figure in the body building world. He is someone who should be able to handle just about any training method thrown at him, yet High Intensity Training hit him pretty hard. Dr. Darden goes on to tell the stories of several more body builders, including Mike and Ray Mentzer. The Mentzers became huge proponents of the High Intensity Training principles. The training programs presented by Dr. Darden have been seen before in other books he has written. However, the programs still have relevance if this is your initial exposure to High Intensity Training. I personally find it very educational when someone with alot of knowledge lays out a training plan. I like to study their approach to the programming and utilize it in my own programming. I find this to be invaluable. If you've read other books by Ellington Darden I would skip this one. If you want to know everything you can about High Intensity Training then this is a must-read book. The content is easy to read and understand. I definitely recommend reading it for students of High Intensity Training. Several years ago I had lower back surgery to repair a ruptured disc. As a result of that surgery, I’ve been continually concerned with potential injuries to my back. At the same time, I want to make my quads grow larger. Everyone told me to squat and squat heavy in order to gain quad size. I gave the squat idea a try, but every time I got to a higher weight where I could really work my quads, I’d get a muscle spasm. I’ve come to decide that those injuries were caused by my fear of getting hurt. As Skip Lacour would say, I let my head take over when my body should have. Whatever the cause, I was very hesitant to do squats as a result of all the problems I’d experienced. I thought all hope was lost until…enter the Quad Blaster. 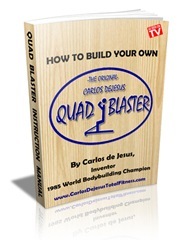 The Quad Blaster is a very simple, but effective device for growing your quads. It can completely replace the squat in your workout routine or just supplement it. Alwyn Cosgrove has called the Quad Blaster an iso-compound exercise because it works like a compound movement and an isolation movement at the same time. 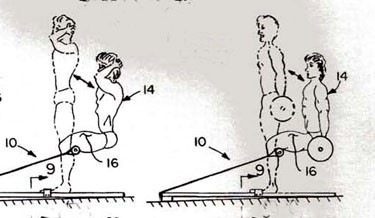 This device was invented and patented by Carlos DeJesus, a world champion natural bodybuilder. Carlos used this device to grow massive thighs during his competition years. Carlos had suffered from lower back pain and was trying to find ways he could squat without pain. Eventually he was diagnosed with a degenerative disc disease which meant no more barbell squats for him. He was a competitive bodybuilder and knew he was going to need something good to make his quads grow. As a result of his own personal issues, Carlos invented the Quad Blaster in 1974. By 1979 he had the plans copyrighted and in 2000 he had the device patented. Through the use of the Quad Blaster, Carlos was able to win the 1981 Natural Mr. USA, the 1981 Natural Mr. North America and the 1985 Professional Natural Mr. World. When I first tried the Quad Blaster I was pretty amazed at how well it worked my legs with just my own body weight. You get into the machi ne with your feet close together. It mimics a narrow stance squat, which is an extremely quad-dominant exercise. Your body travels in a very vertical stance. You are able to add weight as necessary to increase the intensity of the exercise. You can either hold a dumbbell in the front or a barbell in the back to make this an extremely intense exercise. If you stick to proper form a 50 lb. dumbbell will be extremely difficult for you to complete. Intense. This is the most intense workout for the thighs. Don’t be decieved by the simplicity of this machine. Once you’ve tried it, nothing else compares. Safe. You don't need to put heavy-duty weights on your back. Because of the beauty of design, The Quad Blaster generates immense difficulty through leverage so that holding a 10-pound dumbbell translates to 200 pounds to your thighs. This will save your back and knees. It's so well designed that even put through the worst of trails by a World Champion; even he couldn't damage or break it, even with years of use. Portable/Light Weight. Because the total weight is about 15 pounds The Quad Blaster is easily portable and perfect for travel. The side handle makes it easy to pick up and go. Most will especially appreciate this feature. Not exactly what you can do with a bulky machine! Compact. The Quad Blaster is compact enough that it fits in the back seat of your car, in the trunk, or under your bed. Affordable. Priced so that everyone can afford one. There are three ways you can get one. Pick the one that is right for you so you can jump-start your leg training by having your very own Quad Blaster. If you want some serious quad growth, get yourself a Quad Blaster. You will not be sorry that you did. You can buy one full assembled, buy a kit that you assemble yourself or you can buy the plans to do the entire thing on your own.